GM has announced that the new 2005 Corvette will feature the most powerful standard engine ever in Corvette history: the 298kW, 6.0-litre, small-block V8. 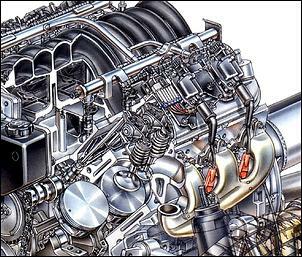 Here in Australia, the new engine is a certainty to flow on to some Holden models - in this article we take a quick look at the engine changes. The new 6.0-litre LS2 is part of the fourth generation of GM's small-block engines. The small-block debuted in 1955 with 265 cubic inches and 195 horsepower. 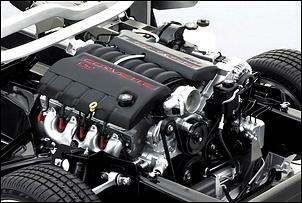 Since then, this legendary family of engines has been an integral component of Corvette's performance history. "It's almost impossible to talk about Corvette without the small-block," said Dave Muscaro, GM Powertrain's assistant chief engineer of small-blocks for cars. 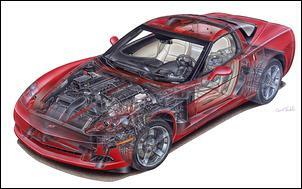 "As Corvette has grown into a world-class sports car, the small-block has grown with it. The LS2 is a state-of-the-art engine that draws on a rich heritage of performance." The LS2 also raises the bar for standard performance in the Corvette, delivering 400 horsepower (298kW) at 6000 rpm and 400 lb.-ft. (544Nm) of torque at 4400 rpm - an increase of 50 horses and 40 lb.-ft. of torque over the previous Corvette's LS1 engine. "More than dynamometer numbers, the LS2 engine's range of power and torque is broad and very usable in everyday driving," said Muscaro. "This engine is smoother, and more refined, but at the same time retains tyre-thrashing output." Mass has been reduced by 7 kilograms on the automatic version. Cylinder heads for the LS2 are derived from designs used in previous Corvette Z06 models, including raised intake ports and an unshrouded-valve combustion chamber design that, when combined with the engine's flat-top pistons, produces a more efficient swirl of the air/fuel mixture. 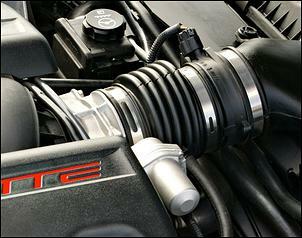 This efficiency enables a higher 10.9:1 compression ratio, which increases fuel economy and horsepower. Valves measure 2 inches for the intake and 1.55 inches for the exhaust. 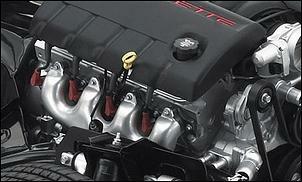 The valve springs also have been upgraded to withstand the engine's increased power and rpm range. 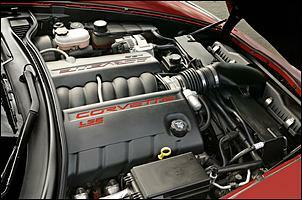 The LS2's new oil pan was developed to ensure oil delivery commensurate with Corvette's high-performance capability. Extensive track testing has shown the new design to provide better oil control under the extreme demands of high-rpm/high g-force driving manoeuvres. The elimination of the previous "gull wing" oil pan design also reduces the engine's oil capacity from 6.5 quarts to 5.5 quarts with a dry filter. Engineers also increased the efficiency and reduced the mass of the exhaust manifolds. Wall thickness of the manifolds is reduced from 4 mm to 3 mm, eliminating weight and helping enhance airflow by approximately 4 percent. Aluminium block with iron cylinder bore liners: The lightweight block is cast from 319-T5 aluminium with cast-in-place iron cylinder bore liners. A die-cast aluminium valley cover and upper deck rails tie together the cylinder banks, increasing torsional and bending stiffness. Deep skirt block: Structural rigidity and operating smoothness is enhanced because the engine block extends below the crankshaft centreline. Cross-bolted main caps: Two horizontal cross bolts for each main bearing cap complement four traditional vertical main cap bolts and contribute additional strength and smoothness to the engine's rotating assembly. Gerotor oil pump: Simple and compact in design, the gerotor-style oil pump fits the shallow oil pan and offers superior pumping capability. Balanced cylinder head design: Performance and efficiency is enhanced with identical airflow and energy direction for each cylinder. Coil-near-plug ignition: A separate ignition coil pack and short spark plug wire for each cylinder maximize the efficiency of the delivered coil energy, enhancing fuel efficiency and power. Electronic throttle control (ETC): Instead of a mechanical linkage between the gas pedal and engine throttle, an electronic throttle control system improves driveability and reduces overall system complexity by eliminating typical conventional mechanical items, such as the idle air control motor, cruise control module and throttle relaxer (traction control). Because the LS2's new engine controller incorporates ETC commands, the separate ETC module used on the LS1 is no longer required. This allows faster communication of the controller to the throttle, as well as reducing the mass and complexity of the system. Additionally, emissions are slightly improved with the damping of unnecessary throttle movement. Improvements to the engine's crankcase breathing and ventilation were made similar to the LS6 engine, including moving the crankcase ventilation system's PCV valve away from the rocker covers and into the block valley. 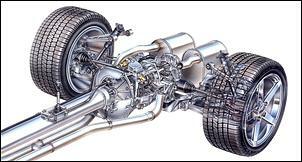 Advances in catalyst substrates made possible catalytic converters that are at the same time more effective and less restrictive for the LS2's exhaust. The new converters are mounted closer to the exhaust manifold for quicker light-off and reduced cold-start emissions. As a result, the more restrictive quad catalyst design of the LS1 - with its small, auxiliary "pup" converters - was not necessary to meet emissions requirements. An additional benefit of the exhaust system's development was the elimination of the LS1's air injection reaction system. Subtle adjustments were made to the C6 exhaust system itself to improve its performance. Sharp angles in the tubing have been replaced with more gradual bends. A larger muffler volume and tri-flow technology eliminated certain periods prone to unwanted noise, particularly between 1500 and 2400 rpm. An inline muffler that flows more efficiently replaces the laterally mounted muffler in the C5. These changes, coupled with one converter per exhaust bank, reduced backpressure in the system and contributed to the LS6's 400 horsepower and 400 lb.-ft. of torque.